When you think of Canada, chances are an image of a snow-capped mountain, rushing river or perhaps the eerie neon glow of the northern lights comes to mind. 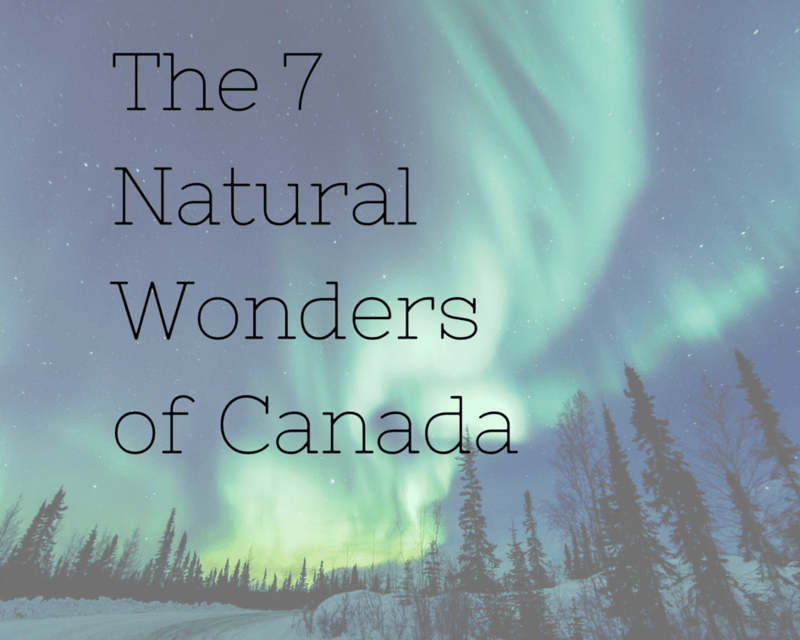 Canada is an expansive space with an extraordinary range of land, waterscapes and natural phenomena, seven of which top our list as the country's most wondrous. If you imagine the water from four of the five Great Lakes rushing and funnelling straight down 167 feet, you get a sense of the force of Niagara Falls. With more than four to six million cubic feet of water pouring over its brink every minute, Niagara Falls is the most powerful waterfall in North America and one of the most famous in the world. Though not the highest waterfall in the country, Niagara Falls is markedly wide and in fact comprises three waterfalls: the American Falls, the Bridal Veil Falls and the Horseshoe (also known as the Canadian) Falls and the Bridal Veil Falls. This aquatic tryptic gushes into the Niagara Gorge, which carves its way along the U.S./Canada border between New York State and Ontario. One of the first natural heritage locations to be designated a World Heritage Site by UNESCO in 1978, Nahanni Park in Canada's Northwest Territories comprises the South Nahanni River, Virginia Falls, sulphur hot springs, alpine tundra, mountain ranges, and forests of spruce and aspen. The park gained notoriety in the 1970's as a favourite retreat for then-prime minister, Pierre Elliott Trudeau. Today, the park has grown to 28,000 km² (10,811 square miles), and although its remote location restricts tourism - it is only reached by helicopter or float plane - many companies operate whitewater rafting, canoe and other adventure tours of the area. Another UNESCO World Heritage Site, Gros Morne offers exceptional beauty by way of towering cliffs, waterfalls, coves, land points, sandy beaches, and colourful fishing villages. Hike the soft and loamy landscape (relatively easy on the knees and back) and set up camp at one of the many waterside sites. A big part of the charm of Gros Morne is the native Newfoundland people you encounter during your visit - famous for their hospitality and good cheer. Most people in the little villages are happy to let you hike through their backyards (literally). Two hours east of Calgary is one of Canada's most unique National Parks where dinosaur history meets stunning scenery. Pinnacles, serpentine spires and other sculptural land formations jut up from these Alberta badlands, creating an eerie environment unlike any other in Canada. This awesome landscape is home to some of the most extensive dinosaur fossil fields in the world boasting the remnants of at least 35 species of dinosaur that lived here 75 million years ago when the area was a lush, sub-tropical forest. Visitors can choose from bus tours, hikes, expeditions and other educational programs. In 1979, Dinosaur Provincial Park was designated a United Nations World Heritage Site. The northern lights (scientific name: Aurora Borealis) is a phenomenon seen in northern skies when solar particles collide with atmospheric gases and create a celestial light show. Depending on how north the location, the colour of these lights can be green, white, red, blue and/or violet. Adding to the spectacle, these northern lights seem to shimmer and dance. The aurora oval - the area where the northern lights occur most often and with greatest intensity - covers a huge part of Canada.